Turn your yard into a "Midway" of Fun, Games and Prizes! Take these Birthday Party games and adapt them for a fun Halloween party for little ones. This party used a theme of "trolls", simply replace the trolls with pumpkins, add a pumpkin hunt, a pumpkin decorating table and a prize booth filled with Halloween items! Have your carnival "barkers" (who could be fellow parents) dress in costumes. Make sure you plan a raindate! Check out the games below and then get ready to plan a Pumpkin Patch party during Halloween season! Here's how to create a carnival of party games. This idea started about 18 years and has been through all 4 of our kids. It is so easy, simple and such fun for the kids, that it has been re-cycled by many of our friends and family for their kids. Best of all, it can held at your home and it is inexpensive. This collage of party games needs some carnival "barkers" to run the games and prize booths. I recruited our older siblings and their friends "work the party". Pick a theme - For Halloween it's a Pumpkin Patch party. The theme for a birthday party could be dinosaurs, Super Heroes, Princesses or anything they want. A carnival birthday party can adapt to the chosen theme. Back in the early nineties, Trolls were a hot item, so our daughter chose a "Troll Theme". Schedule a rain date on the invite and keep the party to 90 minutes! With all the party games you can accomodate a lot of kids..so let them invite away! Wouldn't this cute Pumpkin Patch Halloween party invitation be great if you are theming this party idea for Halloween? We had dad grilling the hot dogs, had a station set up with juice boxes, bags of chips, crackers, fruit snacks..so they could stop over and eat whenever they were hungry! If you are using this idea as a Halloween Party, check out these creative Halloween desserts and fun Halloween Food Ideas. There are recipes for cookies, cakes and desserts that will make your Halloween party all the more festive! They key to this celebration atmosphere lays with the birthday party games. Set up stations all over the yard. Upon arrival, each guest receives a bag to collect their tickets after playing each game. The kids would decorate all these bags with stickers that were part of theme. All the carnival barkers had play dollar bills at their stations. Everyone got one just for trying and an additional bill if they were able to successfully achieve the target. For Halloween, give them a trick or treat bag and make "tickets" on your computer using Halloween clip art. Here are the the easy Birthday party games we used over and over again! We lined up troll dolls as the pins and created a lane on our patio. The kids using a bocce ball, would attempt to Bowl Down the Troll. They got an additional dollar for every one they knocked down on one try. Look at that bowling form.. bet she got a strike!!! We decorated soda cans with pictures of trolls and put some sand in each can. Using a tennis ball, the kids took 3 tries to crush the can and move it off the table. With that wind up those can will all be down for sure! We put troll stickers all over a baseball tee and they took a swing at the wiffle ball off the tee. We spray painted lines on the yard with a point value depending on where their ball landed. We lined troll dolls at the foul line and they shot foul shots from behind the trolls. They tried to make the shot without stepping on or kicking over the troll dolls. We hid mini Trolls all over the yard..so as they went from station to station, they could also look for these... kind of like the Golden Ticket.. For each one they found, they got extra dollars. Look at those lines.. you'd think they were in Disney! We took a big box and my husband drew a troll face, which we then painted and cut out a big mouth. Their mission was to get the water balloon inside the "mouth" without breaking. We had a kiddie pool filled with water and floating with foam trolls.. From a distance they had a fishing net and had to scoop out a troll. They got an extra dollar for each troll they caught! Make a mini golf putting game out of a cardboard box.. you can decorate it according to your theme! More cardboard box ideas.. create a drive in movie theater.. let the kids decorate them and then eat their snacks in their cars while you run a short cartoon! Love the license plates with the kids names on them! A visitor sent us this one on Facebook but no link to the source.. but you can see how easy it would be to do! Prize booth to end your birthday party at home! Prize Booth A Carnival of Birthday Party games must have a prize booth! At the end of the game session, which lasted about 1 hour, the kids head over to the prize booth. We ordered all kinds of things from Amazon.com in bulk and had labeled them with the # of tickets needed. I let our older kids "price" the prizes with the number of tickets required to buy each item! The kids then used the tickets in their bags and filled up their own goody bags! It always amazed me that no matter how many times or with different groups of kids, these birthday party games were always a success. They could go for an hour playing these simple games, over and over again. Look at some of the lines in those pictures! 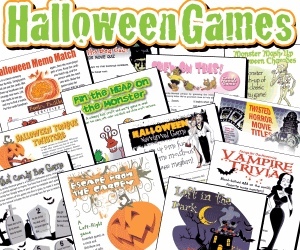 See our fun assortment of Halloween games that you can use along with these Birthday Party Games for a Halloween party.